Although it appears on the Milton Keynes Heritage website as a ‘Jewel’ of Milton Keynes we have decided to release the story of Your Loving Brother Albert as a CD-ROM that you will be able to view through the web browser on your computer at your leisure. 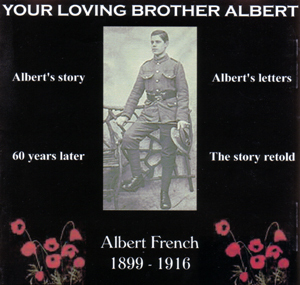 In 1975 a bundle of Albert French’s letters, written during the First World war from his training camp and the trenches of France, were found at the bottom of a box of books at a second-hand furniture store. These letters have inspired books, a play, radio documentary and theatre in education production. The whole amazing story is told here in a website which includes sound and video clips as well as full copies of each of Albert’s letters.